Due to popular demand, we have now added a few farms in Kent County, Maryland. This will give us another and later season than New Jersey because Maryland stays open two weeks later. All farms receive very limited pressure and are large- 400 acres and over. All hunting is done from pits. Marylands' Eastern shore winters close to one million Canada gese each fall with a majority in Kent County. Kevin Popo Guide Service specializes in Canada Goose hunting in New Jersey and on Maryland's Eastern shore and Puddle Duck hunting in New Jersey. Come spend a day afield with Two-Time World Goose Calling Champion Kevin Popo. We provide you with the deadliest combination for Canada Geese and Puddle Ducks, good farms and impoundments, world-class calling, quality decoys and comfortable pits and blinds. Due to its large number of grain farms, southern New Jersey hosts some of the largest concentrations of Canada geese in the state. We are surrounded by large bodies of water that hold good concentrations of geese throughout the season. This water is both tidal and non'tidal so freeze up is not a problem. Another bonus of hunting in New Jersey is the Canada goose limit is 3 birds as opposed to Maryland Eastern shore which is only 2 birds. Click Here for more info on New Jersey Goose Hunts. Due to popular demand, we have now added a few farms in Kent County, Maryland. This will give us another and later season than New Jersey because Maryland stays open two weeks later. All farms receive very limited pressure and are large- 400 acres and over. All hunting is done from pits. Marylands' Eastern shore winters close to one million Canada gese each fall with a majority in Kent County. Click Here for more info on Maryland Goose Hunts. Our New Jersey duck hunting is both productive and convienant. 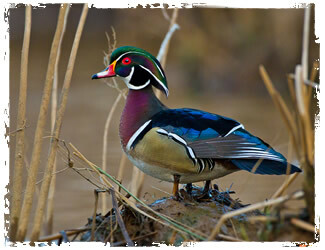 All of our blinds are on impoundments and farm ponds (both are non-tidal) which means easy access. No more boat rides in the dark, trying to walk through knee deep mud or having your gun and clothes covered in mud- all experienced when hunting a tidal marsh. Click Here for more info on NJ Duck Hunts. Southern New Jersey holds upwards of 150,000 snow geese during the fall and spring. Most of these birds are in Salem and Cumberland county. Generally the birds show up in late October and leave in mid-March. New jersey snow goose hunting presents two unique challenges. First,these birds sometimes will fly over to Delaware to feed for the day. Another second factor to contend with here in New Jersey are the huge tidal marshes where the birds roost. Generally the birds will not leave the marsh preferring to stay and feed on the salt hay fields that are so numerous in New Jersey tidal marshes. But once the weather turns cold that is when the birds head inland from 2- 20 miles to find higher protein food like corn, soybean or wheat. Click Here for more info on NJ Snow Goose Hunts. 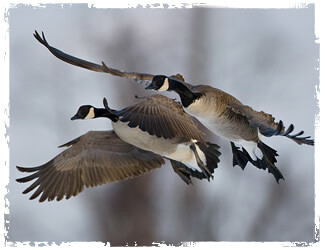 Call Kevin Popo to book your Canada Goose Hunt in Maryland, Delaware or New Jersey.